"Lord, what fools these mortals be"
A meeting in the forest. Oberon (Andrew Foley) and Titania (Mara Rixton) and their parties run into each other early in the play. 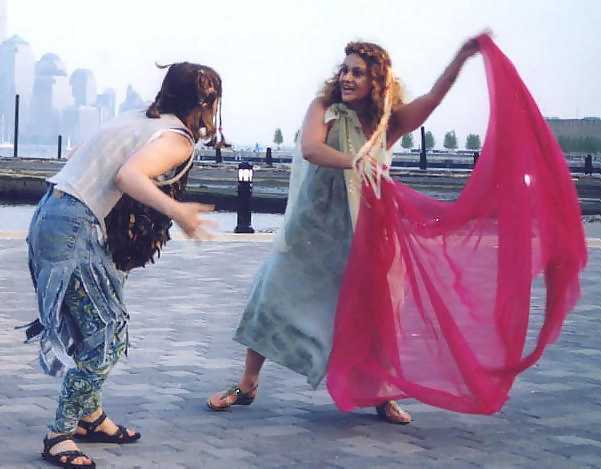 Returning to its roots, Hudson Shakespeare decided to revive its first show. Once again L. Robert Johnson took the helm as director of a show he had come to know very well, through appearing in it as well as directing it years earlier. This time around, Johnson decided to stage this as a fully costumed version, but complete with the timeless look that has come to be a staple look for HSC. 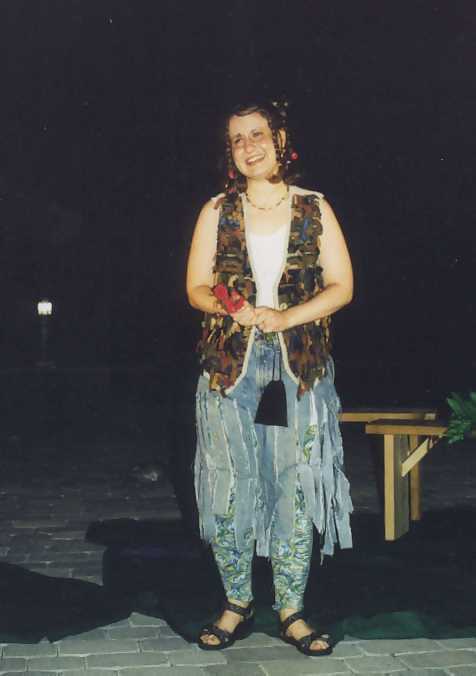 As the original "Dream" production had been an inaugural show for the company, so too was this production. This grouping of pictures was taken at the then newly dedicated Frank Sinatra Park. A sunken amphitheater, complete with outdoor cafe and a breath taking view of the New York Skyline. HSC became the first live theater group to perform at this venue and has returned ever since. 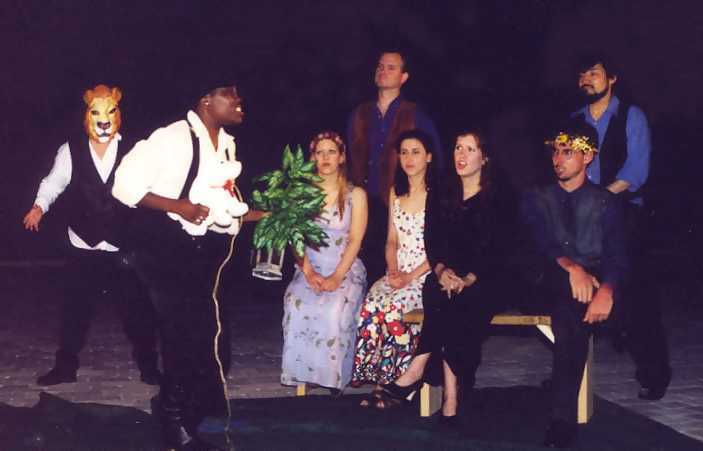 Above from left, Puck (Janine Flood), Oberon (Andrew Foley) meet with Titania (Mara Rixton) and her train of fairies in the beginning of the show. Middle left Hermia (Raine Brown) and Lysander (Rick Brown) share a quiet moment as after they run away from Athens. Middle right, Puck bids the audience good night. 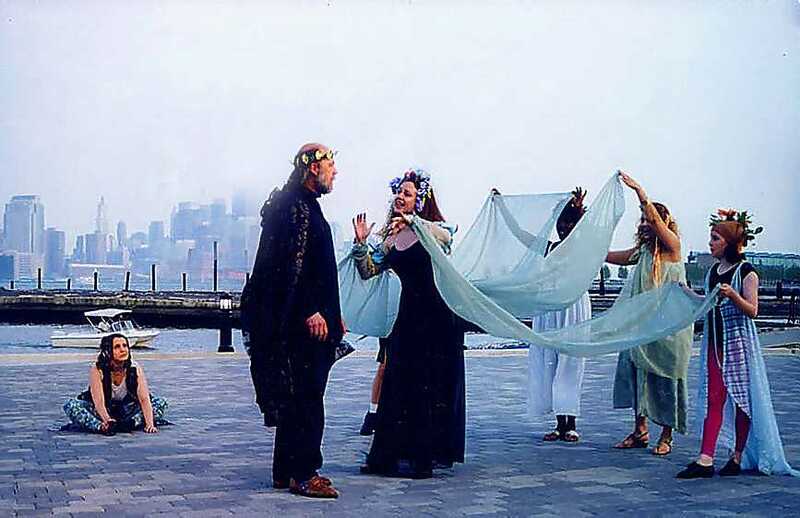 Bottom left, the meeting of Pyramus (Jon Ciccarelli - right) and Thisbe (John Short) through the Wall (Jennifer Short) during the production of the mechanicals. Bottom right, another scene from the mechanicals play. 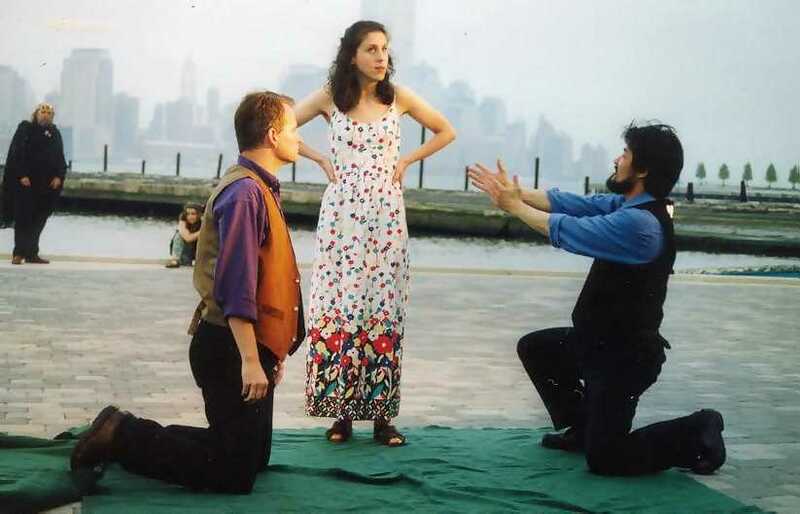 Above, Helena (Susan Poliniak) acts in disbelief as Lysander (Rick Brown) and Demetrius (Ryohei Hoshi) express their undying love for her after being laced with Oberon's love potion. 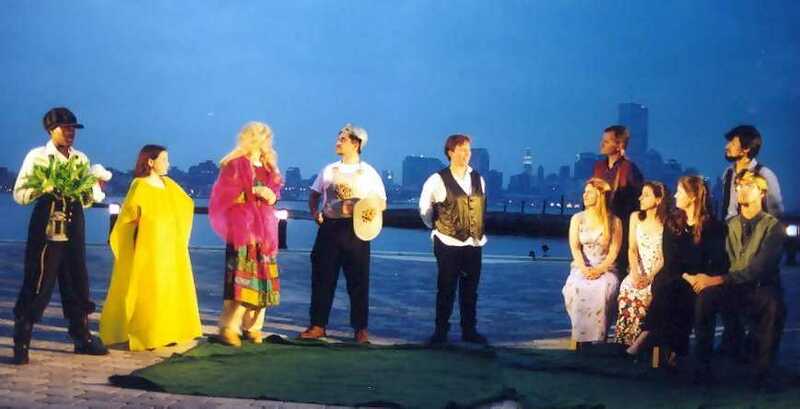 Below, the mechanicals gather for their play at Duke Theseus' wedding. Above left, Moonshine (Chandra Rule) entertains the newlyweds. Above right, Puck (Janine Flood) gives the farewell epilogue to the audience. 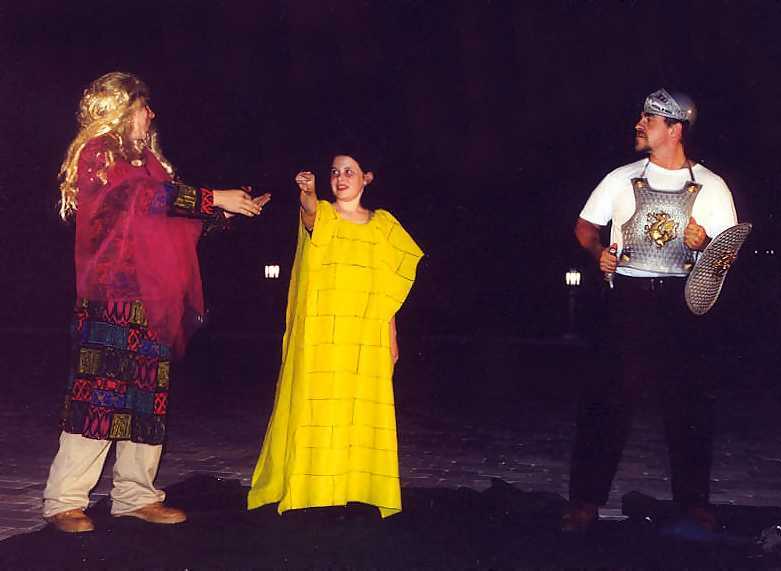 Below, the meeting of Pyramus (Jon Ciccarelli, right) and Thisbe (John Short) through Wall (Jennifer Short). To link to an on-line version of A Mid Summer Night's Dream, click here.